The 1981 comedy-msytery Cutter’s Way is director Ivan Passer’s and screenwriter Jeffrey Alan Fiskin’s sun-drenched neo-noir near-classic, a slashing adaptation of Newton Thornburg’s novel. 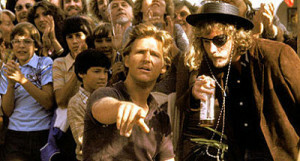 Originally entitled Cutter and Bone, the film provides a devastating look at post-Vietnam, post-Watergate America, as exemplified by its trio of damaged protagonists: a slightly dim beach-boy gigolo (Jeff Bridges, Fat City), a ferocious disabled veteran (John Heard, Cat People), and the cynical, alcoholic young woman (Lisa Eichhorn, The Vanishing) they both love. All three actors are nothing short of combustive here, in a dark tale (set against a gorgeously sunny Santa Barbara) about the attempt to pin a murder on a fat-cat plutocrat (Stephen Elliott, Beverly Hills Cop) who may, in fact, be guilty.